​Where do you live? I live in Vantaa, Finland. Name one artist who inspires you to create and tell us why. I don't follow any particular artist. I'm inspired by different crafters, craft magazines, DT work in challenges and especially new crafty stash. What is your favourite crafting technique and why? I love stamping and colouring character images. Colouring is so relaxing. What do you usually do when a project doesn't go to plan? Embellish. I rarely throw anything away. Name one technique you have never used and explain why. I don't like to get too messy so I don't use techniques where I would have to use my fingers to spread the product. If you could be any figure in history, who would it be and why? I'm happy being me and wouldn't want to be any figure in history. "I'm so honoured to be the Top Talent this month. Quite unintentionally the colours and embellishments I chose for my card resemble the ones I used in the card I won the Make Time Mood board Challenge with. The inspiration for this card came from a steampunk design paper I bought from a sale. 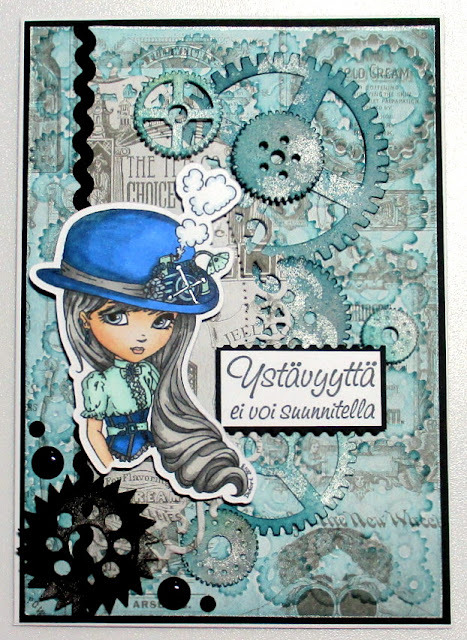 I embossed and inked the paper and embellished the card with cogs which I decorated with ink, embossing powder and distress stain. 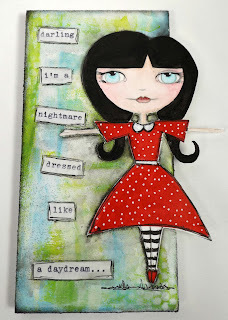 I coloured the image with Promarkers and added some ribbon, enamel dots and rhinestones." 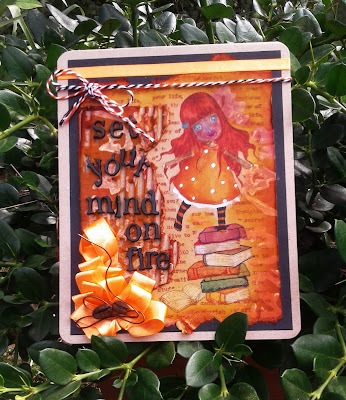 Lots of gorgeous layers and techniques Mari in your wonderful card! A beautifully coloured and fussy cut image too which finishes of that clever background. Having never used a Promarker ever, I'm constantly in awe of people who are able to use this product with such skill. Thank you so much Mari for joining us as our Top Talent in March. You were a dream to work with! Artistic Outpost will be donating a $15.00 gift certificate to our randomly drawn winner to spend at their on-line sister-store Our Daily Bread Designs, where Artistic Outpost resides. One not to miss in my opinion! Just link up your project with us and you could win that randomly drawn prize, be one of our top three talent or perhaps even our new featured Top Talent guest for the month of May! Look forward to seeing our next Top Talent in April. Thanks for joining me again this month. Welcome to the second of our Sponsor Spotlight posts at OCC in March. 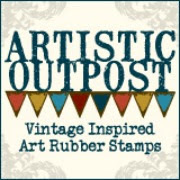 I am here today to show you what I created with my new Artistic Outpost stamps. I struggled with my decision which AO stamp set to choose…so many beautiful choices. 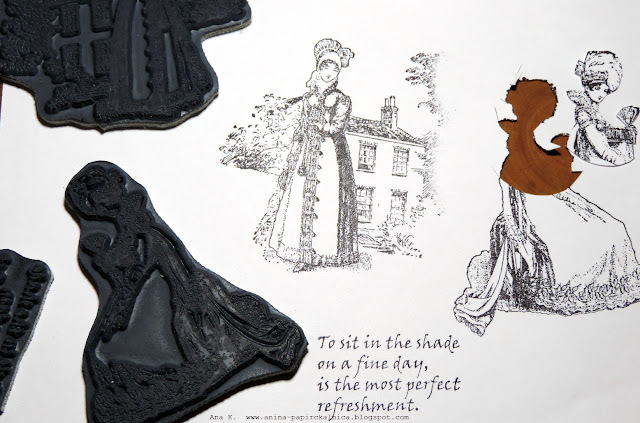 Finally I chose Jane's Countryside set…gorgeous delicate designs and words…. When I unpacked my stamps, I really didn’t have any idea what I would like to make. 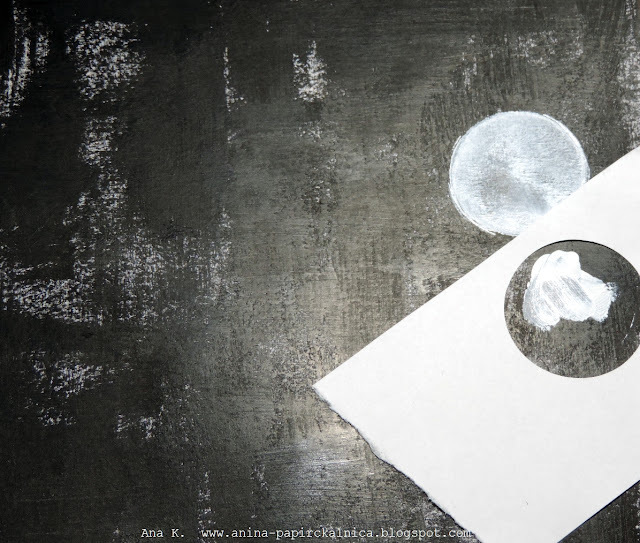 In such cases I start working in bigger format of paper, which can be cut later if needed. I let my head relax completely and just started playing around…. Usually I get inspiration on some point. If not, I set everything on the side and try again later…. "To sit in the shade on a fine day"
Yes, I will made covers for small notebook…. 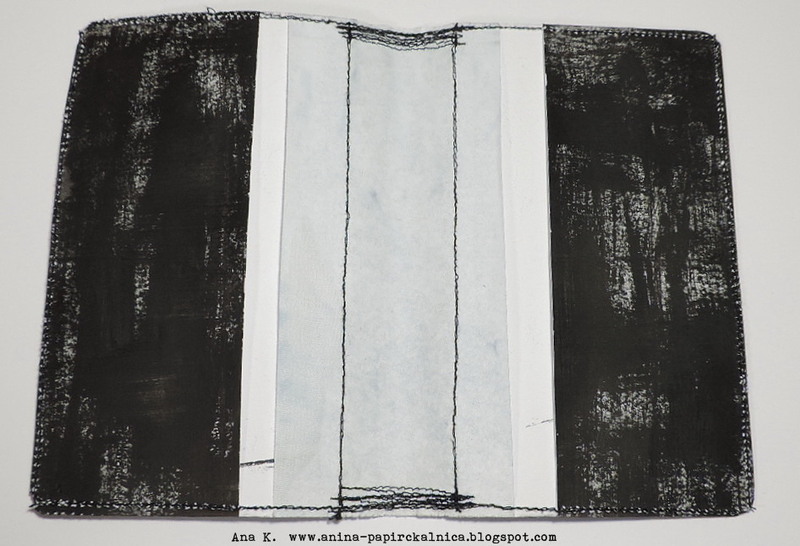 I started colouring cardstock with black acrylic paint. 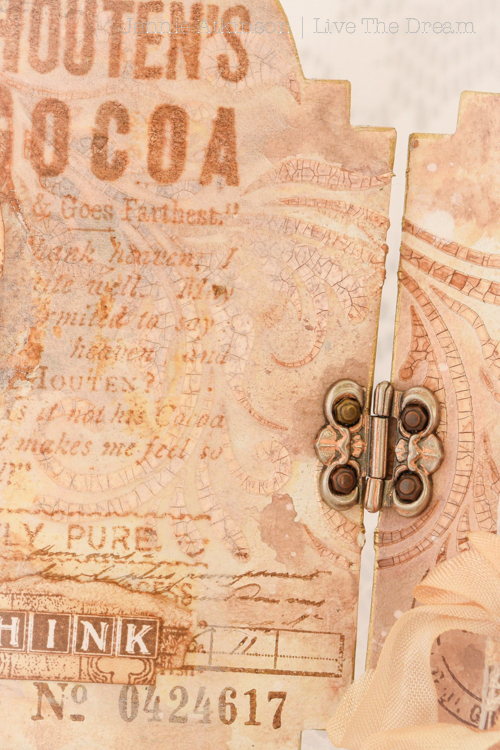 Paint was applied with dry brush and cross motions…some tiny parts of cardstock left unpainted, so white background pop up in a beautiful, distressed way. When the paint was dry, I added white circles…a thin layer of paint was applied with my finger through a homemade stencil. 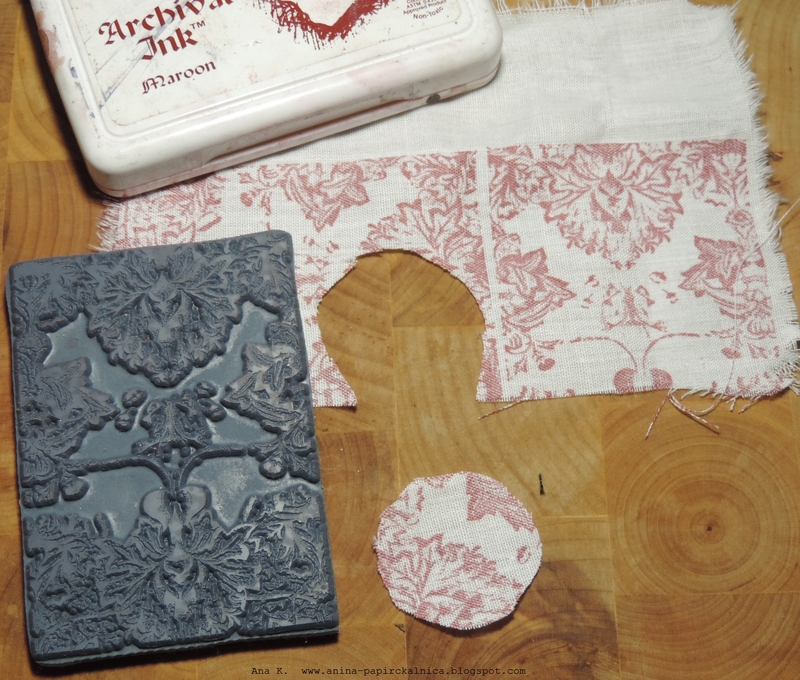 I stamped the Pattern stamp on cotton fabric with red ink. 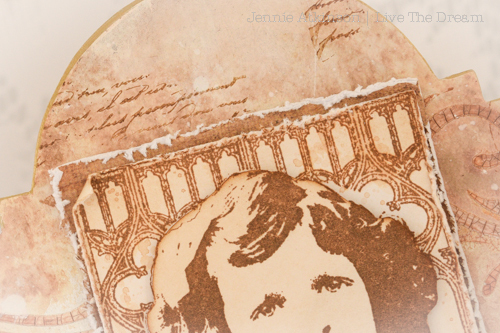 All images were cut to fit the circles on the background….I also added some vintage paper with distressed edges. When everything was glued, I used black marker and traced around the edges. 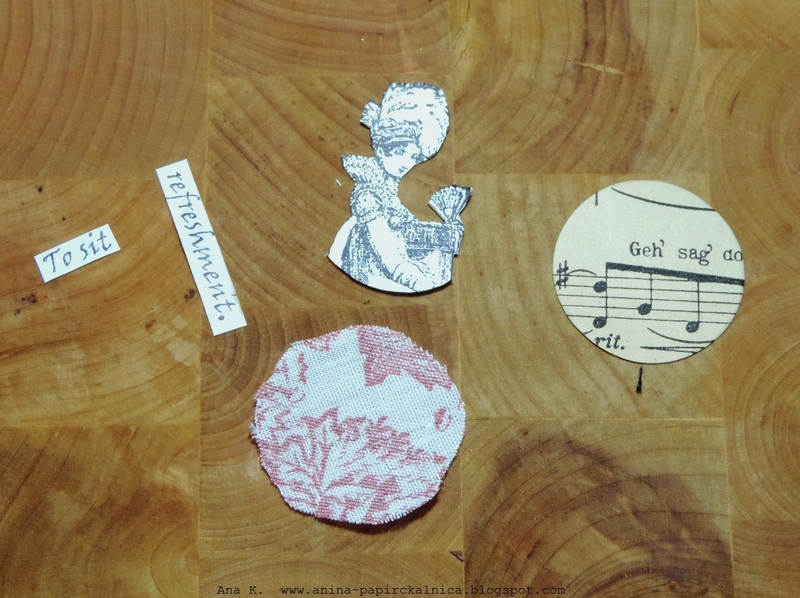 Then I cut paper to fit the notebook, added fabric and sewed together. 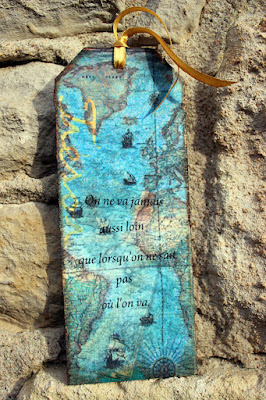 ....to sit under the tree, sketch and admire beautiful Artistic Outpost images….. 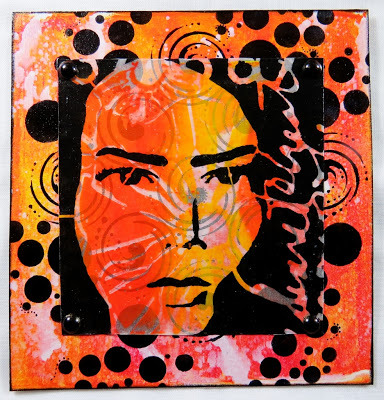 If you would like to be in with a chance to win a voucher worth $15.00 to spend at Artistic Outpost and get one of these amazing stamp sets, then all you have top do is join in the challenge this month. We are re-visiting old challenges - so take your pick of the ones on the list and join in the fun! You could be the prize winner or even picked to be here as our Top Talent!!! 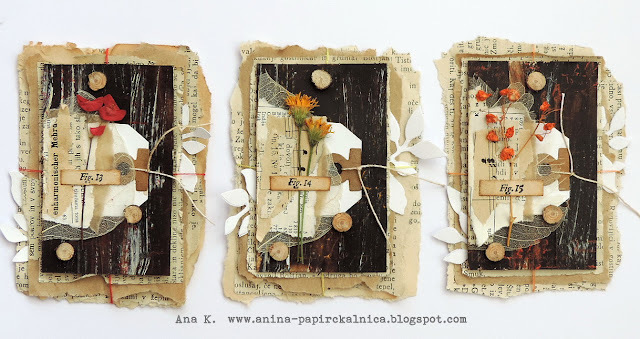 Today we have our amazing Jennie, who got the chance to play with one of my favourite Artistic Outpost Stamp sets - and she has really inspired me to get that gorgeous stamp set out again and play! 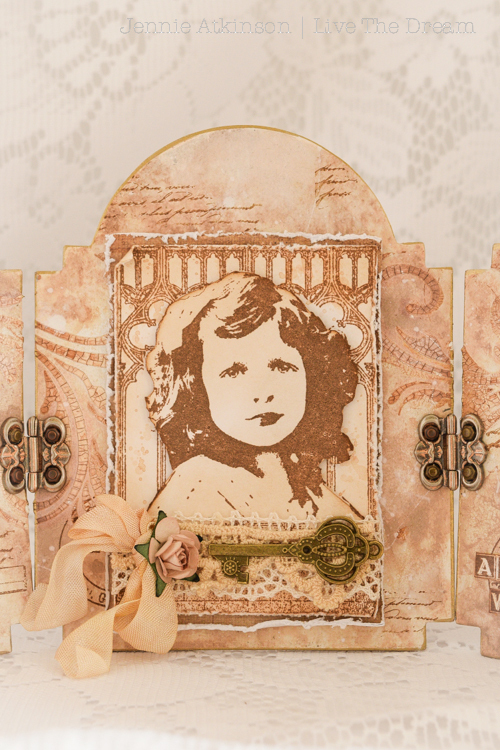 Her beautiful, delicate work is perfect for this stunning stamp set and I am sure you will agree....she has really done Artistic Outpost (and us!) proud! 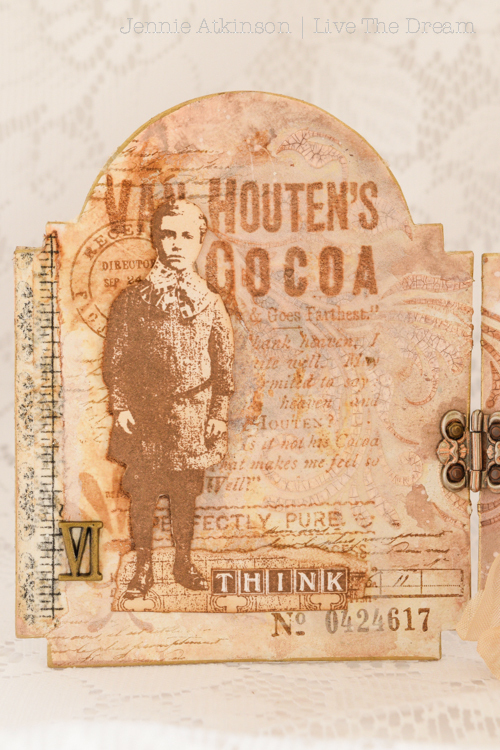 I am a great fan of Artistic Outpost stamps, not just because they suit my vintage style, but they stamp so beautifully despite being incredibly detailed. I chose the Think and Wonder set as it has been on my favourite list for a long long time but more importantly because I have always wanted to create a Triptych and I thought these would be just perfect having three main images. We also live in an old Manse (c.1840) here in Shetland and I often think of the young children who grew up here in Victorian times and these stamps are a lovely reminder of them. 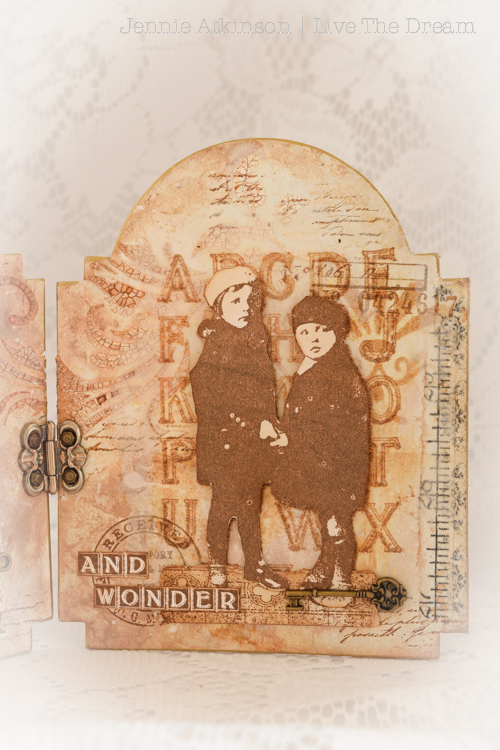 I have used mixed media and stamping on my background and created layers with the stamps on the top using different techniques. I used my die cutting machine to cut three backgrounds from heavy grey board and gave them all a coat of gesso. I then lined them up on my craft mat and and used crackle paste and a flourish stencil across all three backgrounds so there was a "flourish flow" across them all. Once the crackle had dried everything got sprayed with Vintage Photo Distress Spray Stain and lots of water. 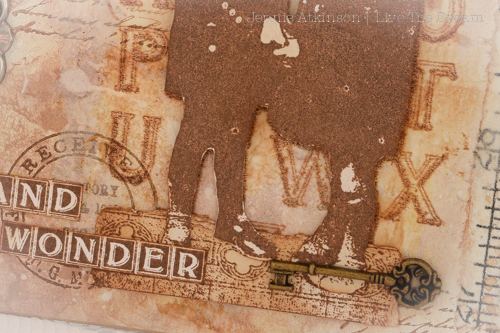 I also over stamped here and there with a little text stamp and some other small stamps using Archival Brown Ink. And then it was time to have fun with the stamps! 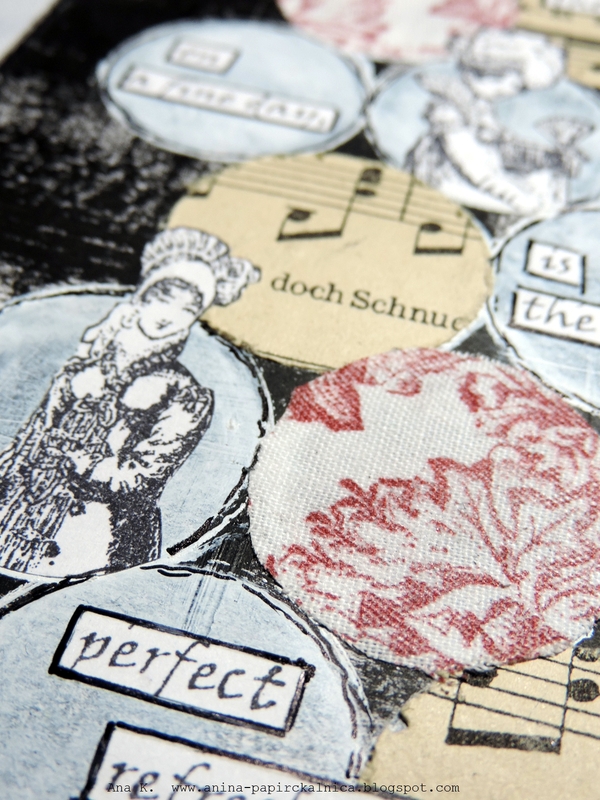 I created a focal point for my middle section by layering papers and the stamped images. 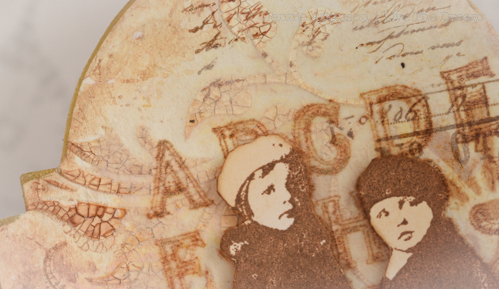 The images were stamped on white cardstock but good old Vintage Photo (blended and splattered) gave me the colour I was looking for - slightly lighter than using cream cardstock. I used some of my usual favourite embellishments to create a thick layered look on this central panel. 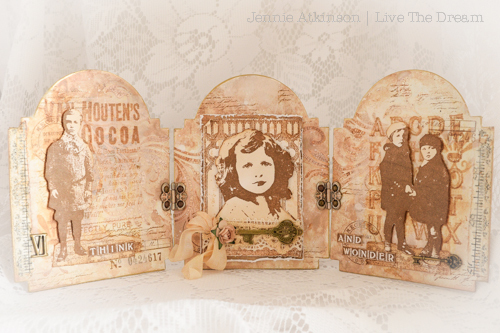 I did the same on the right hand panel for these two gorgeous little girls. The images on the side panels needed something to ground them and so I stamped a part of the central image which has a lovely vintage style pattern at the bottom of the frame and used this as their grounding piece. 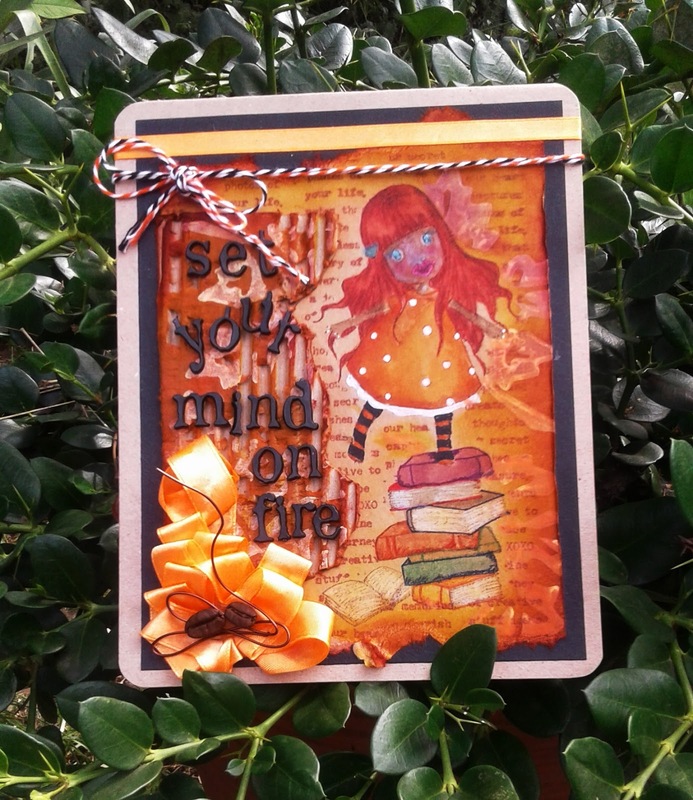 There are so many wonderful quotes with this stamp set it was difficult to choose one, but I felt that the blocked Think and Wonder worked so well with the detail of the panels. The stamps were a joy to work with and I was very pleased with my first attempt at a Triptych. A huge thank you to Artistic Outpost for the opportunity of letting me play with this fabulous set. WOW!!! 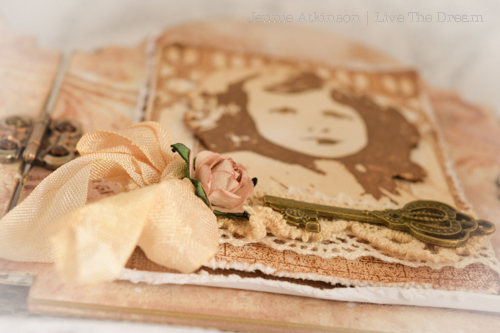 Jennie I LOVE this - so vintage, delicate and amazing - I could look at it forever! Welcome to the finale of my challenge "Sew and Sew". I am so excited to announce the winner and the Top 3. I asked you to create texture, layers and loveliness using a sewing theme and wow you certainly did that. There was a great variety of projects and I had so much fun looking at them and finding out how you created them. A huge thank you to everyone who participated. 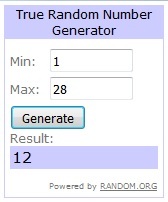 Before I announce my winners I just have to announce the prize winner who was selected via Random.org. I loved everything about this project! There are so many layers and vintage sewing embellishments. When I look at this I can see how much Roni enjoyed making it. 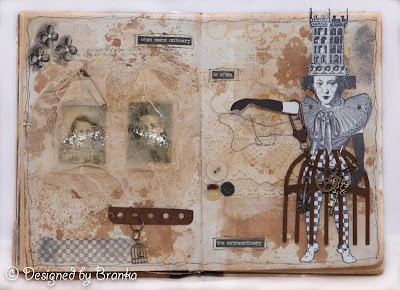 I loved the layers in her work, the texture and use of unusual items. The tea bags over the photos is so subtle. This just looked so much fun! The colours, patterns and layers went together beautifully. create a masculine page for her son. Thank you again everyone who joined my challenge. Well, it isn't exactly new.... but before I go onto the challenge details for March, I just wanted to let you know about this months Sponsor. Artistic Outpost will be donating a $15.00 gift certificate to our randomly drawn winner to spend at their online sister-store Our Daily Bread Designs, where Artistic Outpost resides. Definitely a prize worth winning! And what do I want you to make this month? I want you to take a trip down memory lane! I have decided to shorten the list of challenges a little by leaving out seasonal challenges and some very recent ones - so please select a challenge from the list featured here. Any entry that is not a challenge from this list will not be included in the Random.org prize draw and will not be selected as Winner or Top 3. So make sure you select a challenge from this list! So click the link - reacquaint yourself with the rules of the challenge you want to do and have fun! interpretation of the August 2013 "Words, Words, Words" challenge. in books and those words setting your mind alight and alive with wonder. I created this cute little card for it. The background was stamped with whole lotta nice words too! 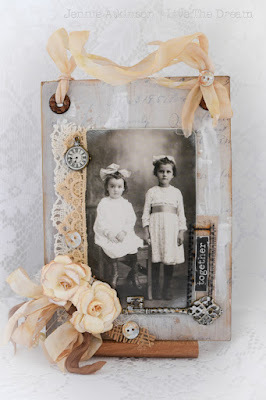 elements to create this vintage hanging. I decided to do the May 2014 challenge - "Love Those Leftovers!" 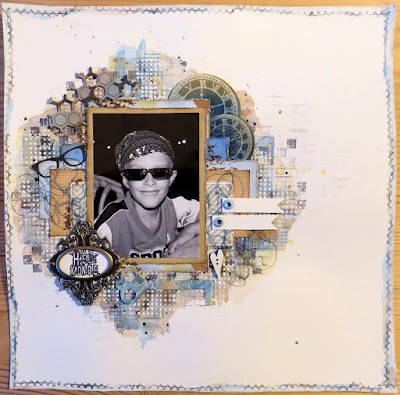 I was inspired by the August 2014 challenge 'Summertime'. I chose to re-visit the April 2014 Challenge 'With A Song In Your Heart'. I love using song lyrics on my art... and this one by Taylor Swift is just perfect! .I chose to alter a simple cardboard frame from the Poundshop. 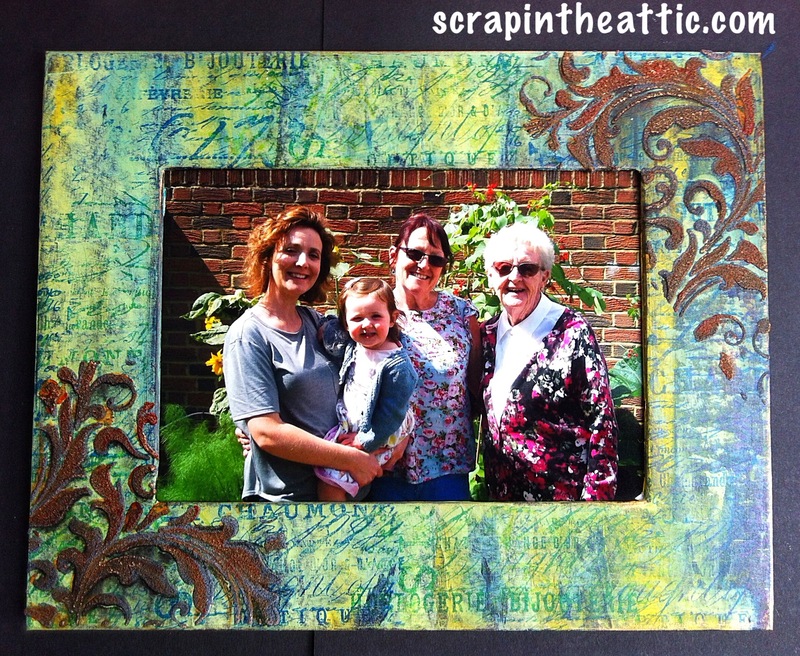 The photo is our four generations, I took the colours for the frame from the garden and added the rust to simulate a wrought iron gate. WOW!! what an amazing variety of posts from the OCC team!! With so many challenges to choose from the possibilities are endless this month! Dive into the challenges of the past and see what fun you could have!